My column went up today, which is a day early. After going back and forth on last minute edits with my editor, Jill, this morning, it got sent to Rich, the chief editor, where he decided to put it up today around 11:00am. I initially thought it was a mistake, but he explained the regular Wednesday columnist passed on this week, so he decided to go with mine today. All good. Anyway, it's not the best piece of writing, but I just geeked out and had fun writing this comparison of the tech world with the world of poker. Check it out! As Yahoo previews its new blogging service, the rest of the players evaluate their hands and place their bets on what will and won't work in the search/portal space of the future. Last week, I attended a preview session of Yahoo's new blogging and social networking service, Yahoo 360, in which nine people in the slogging space gathered to provide feedback. The discussion was interesting and insightful—and of course everyone was wondering how Yahoo will integrate Flickr, the photo-sharing service it just acquired, into the offering. In the end, many of these "influencers" indicated they wouldn't use the service—either because it's too simple or because it's closed (among other reasons). Some said that if their friends were heavily integrated into Yahoo products (for example, Yahoo Messenger or Groups), they would recommend it. Only one person stated she would definitely use it. In one of the few positive comments, AlwaysOn editor-in-chief Tony Perkins voiced his belief that the service would work due to Yahoo's huge installed base and the service's tight integration with other Yahoo products. I happen to agree—with the caveat that two additional factors will drive that success: integration with the company's photo products and well-thought-out privacy controls. Some features to note in the new service include Latest from My Friends, which provides an overview of your network activity, including the latest posts, pictures, and comments posted by your friends (a feature I first saw on Wallop, the blog research project for the Social Computing Group at Microsoft Research); Blast Message, which allows you to message your entire network; and the service's tight integration with Yahoo Groups, which could become a popular function due to the heavy built-in user activity. The difficulty Yahoo faces in marketing Yahoo 360 lies in trying to offer something for everybody. While Yahoo is targeting a few primary market segments, it doesn't want to isolate or turn off any of the users in the Yahoo universe. Overall, it appears that the Yahoo 360 team has built a solid product based on careful research about what users want and their feelings about the slogosphere's current offerings (for example, MySpace, Friendster, and Linkedin). Even before I had the opportunity to preview Yahoo 360, however, I'd concluded that Yahoo was finally catching up to Google in providing products and services for the next-generation web. With its acquisition of Flickr, launch of a competitor to Google's Adsense, and creation of the Yahoo Media Group in Santa Monica, Calif., Yahoo is looking strong for the future. To me, this whole search/portal space is beginning to look like a game of no-limit Texas Hold 'em, with the major players resembling the world's leading poker players. Google reminds me of Phil Ivey, the young star who burst into the poker world a few years ago with three gold bracelets at the World Series of Poker (and tied with Phil Hellmuth and Ted Forrest for most wins in a single year). Cool, innovative, and fresh: These words describe both Google and Ivey. Yahoo, meanwhile, is the Phil Hellmut of this industry space. Having experienced early stardom as the youngest winner of the World Series of Poker (at age 24), Hellmut is now a brash veteran of the poker world. His ability to read opponents' cards -- whether or not he executes -- is uncanny. Hellmut's recent huge win at the Golden Nugget's National Heads-Up Poker Tournament coincides with Yahoo's big moves this month (acquiring Flickr and launching 360). Finally, Microsoft is the Doyle Brunson of the tech world. A poker legend, Brunson has nine gold bracelets from the World Series of Poker and wrote the poker bible Super System (Cardoza, 1979), which almost every poker enthusiast has read. Whether or not they admit it, many of today's players have patterned their games after Brunson's -- just as many players in the blogging marketplace have copied Microsoft's methods and research. I've seen this in some of the Wallop functionality that's been incorporated into Yahoo 360. In addition, Microsoft's Smart Tags served as a forerunner to Google's Autolink functionality, which lets users insert Google partner links into web pages. In the world of search, portals, and the slogosphere, the players have already called all-in -- meaning they've bet all their chips and shown their two face-down cards. Now, let's take a look at how this game is poised to play itself out. Over the past year, the flop (the first three out of five community cards) went down showing an ace of diamonds, jack of hearts, and 10 of hearts. Google acquired Picasa in the photo space, bought Keyhole, made Blogger a significant part of its universe, launched its desktop search beta, and began expanding its international operations. The company's hole cards turned out to be two jacks, meaning the hot, hip company was looking at three of a kind and sitting pretty. Yahoo was initially quiet with a healthy increase in revenue in 2004 (from $1.6 billion to $3.6 billion) and a net income growth of 252.9 percent, but no major activity to write about here. Sitting on an ace of hearts and a king of hearts and looking at a potential royal flush, Yahoo was an in-betweener -- great potential, but all it had at the flop was a pair of aces. Meanwhile, the Microsoft juggernaut was humming along with the launch of its blogging service (MS Spaces). With its cookie-cutter interface and functions, however, the service didn't generate much fanfare: With a 10 of spades and a two of diamonds and nothing but a pair of 10's to show, the audience was left wondering why the old man went all-in with a 10 and a two. On the turn, the fourth community card was revealed to be a two of spades -- which means no one can beat Google's three jacks. With the launch of its map service (in my opinion, it's better than Yahoo's), personalized news, and even its messy Autolinks (which had much of the blogosphere crying foul and citing Google for unethical behavior), Google is still the hand to beat. While Yahoo is sitting on a pair of aces, the company's increased activity in the social networking space has led to speculation that it knows something the rest of the players don't. Yahoo was looking past that pair of aces to the possibility of a royal flush on the river (the last community card to be shown). Microsoft, meanwhile, improved its hand slightly with two pairs (10's and twos). The company launched its new search service, but the loudest sound came from Bill Gates's declaration that "today's search is nothing." Is the old man grumbling at the poker table, or is this a serious threat? Finally, comes the fifth community card (the river card) -- only in this game, it hasn't been revealed. Will it be a two of hearts to give Google a full house (jacks full of deuces) over Microsoft's full house (twos full of 10's)? 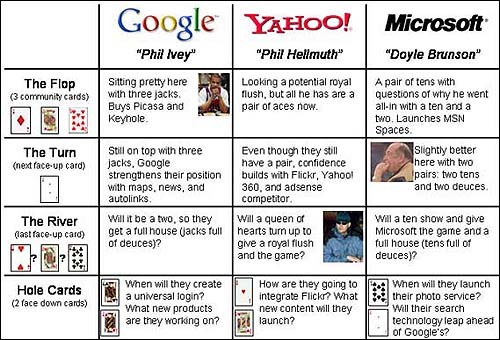 Will it be a queen of hearts to give Yahoo its royal flush or a 10 of clubs to give Microsoft the sole full house (10's full of deuces)? Or will it be a nothing card, allowing Google to retain its position at the forefront of this emerging market? The possibilities are many, and trying to pick a winner in this game is as difficult as trying to come up with answers to any of the following: When will Google create a universal login for its services, and what new products is it working on? How will Yahoo integrate Flickr into its platform; how will its "adsense" program compete with Google's; and what new content product will it deliver to its users? When will Microsoft launch its Adsense competitor and announce its efforts in the online photo space, and how will it integrate its social research projects (such as Wallop) into its service offerings? And, finally, will Microsoft's search technology be better than Google's within three years? And what about AOL? Well, ever heard of Thomas "Amarillo Slim" Preston? He was an old legend long forgotten. And how about IAC? Will that company be like Greg "Fossilman" Raymer, a flash-in-the-pan player who became extinct faster than you can say "ice age." The questions and guessing are endless in this World Series of Poker, tech style. UPDATE: Since the old AlwaysOn site was taken down and posts were not properly transferred, I'm leaving a copy here.